For Python code style follow PEP 8 plus the guidelines below. Use single-quotes for string literals, e.g. 'my-identifier', but use double-quotes for strings that are likely to contain single-quote characters as part of the string itself (such as error messages, or any strings containing natural language), e.g. "You've got an error!". Single-quotes are easier to read and to type, but if a string contains single-quote characters then double-quotes are better than escaping the single-quote characters or wrapping the string in double single-quotes. We also use triple single-quotes for docstrings, see Docstrings. Avoid creating circular imports by only importing modules more specialized than the one you are editing. 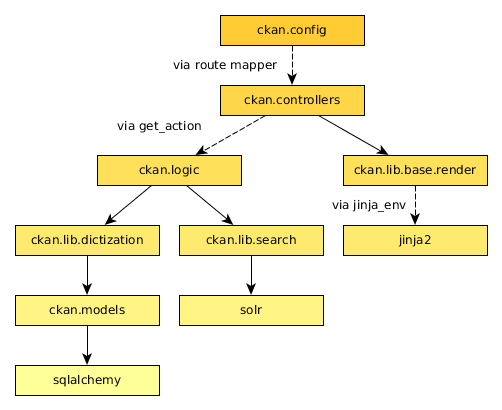 CKAN often uses code imported into a data structure instead of importing names directly. For example CKAN controllers only use get_action to access logic functions. This allows customization by CKAN plugins. Most of the current CKAN code base imports just the modules and then accesses names with module.name. This allows circular imports in some cases and may still be necessary for exsiting code, but is not recommended for new code. Don’t include object representations in the log message. It is useful to include a domain model identifier where appropriate. Choose an appropriate log-level (DEBUG, INFO, ERROR, WARNING or CRITICAL, see Python’s Logging HOWTO). Don’t use the old %s style string formatting, e.g. "i am a %s" % sub. This kind of string formatting is not helpful for internationalization. All modules and all public functions, classes and methods exported by a module should normally have docstrings (see PEP 257). Keep docstrings short, describe only what’s necessary and no more. Keep docstrings simple: use plain, concise English. Generally, follow PEP 257 for docstrings. We’ll only describe the ways that CKAN differs from or extends PEP 257 below. For the full list of types of cross-reference, see the Sphinx docs. Cross-referencing objects like this means that Sphinx will style the reference with the right CSS, and hyperlink the reference to the docs for the referenced object. Sphinx can also generate error messages when non-existent objects are referenced, which helps to keep the docs up to date as the code changes. All public functions that CKAN exports for third-party code to use should document any exceptions they raise. See below for how to document exceptions raised. For example the template helper functions in ckan.lib.helpers, anything imported into ckan.plugins.toolkit, and all of the action API functions defined in ckan.logic.action, should list exceptions raised in their docstrings. This is because CKAN themes, extensions and API clients need to be able to call CKAN code without crashing, so they need to know what exceptions they should handle (and extension developers shouldn’t have to understand the CKAN core source code). On the other hand, internal functions that are only used within CKAN shouldn’t list exceptions in their docstrings. This is because it would be difficult to keep all the exception lists up to date with the actual code behaviour, so the docstrings would become more misleading than useful. Code should only raise exceptions from within its allowed set. Each module in CKAN has a set of zero or more exceptions, defined somewhere near the module, that code in that module is allowed to raise. For example ckan/logic/__init__.py defines a number of exception types for code in ckan/logic/ to use. CKAN code should never raise exceptions types defined elsewhere in CKAN, in third-party code or in the Python standard library. All code should catch any exceptions raised by called functions, and either handle the exception, re-raise the exception (if it’s from the code’s set of allowed exception types), or wrap the exception in an allowed exception type and re-raise it. This is to make it easy for a CKAN core developer to look at the source code of an internal function, scan it for the keyword raise, and see what types of exception the function may raise, so they know what exceptions they need to catch if they’re going to call the function. Developers shouldn’t have to read the source of all the functions that a function calls (and the functions they call...) to find out what exceptions they needs to catch to call a function without crashing. Insert examples of how to re-raise and how to wrap-and-re-raise an exception. '''Return the members of a group. '''Return a list of all packages that have this tag, sorted by name. '''Return all tags whose names contain a given string. then only tags from that vocabulary are returned. The phrases that follow :param foo:, :type foo:, or :returns: should not start with capital letters or end with full stops. These should be short phrases and not full sentences. If more detail is required put it in the function description instead. Indicate optional arguments by ending their descriptions with (optional) in brackets. Where relevant also indicate the default value: (optional, default: 5). Docstrings from CKAN’s action API are processed with autodoc and included in the API chapter of CKAN’s documentation. The intended audience of these docstrings is users of the CKAN API and not (just) CKAN core developers. In the Python source each API function has the same two arguments (context and data_dict), but the docstrings should document the keys that the functions read from data_dict and not context and data_dict themselves, as this is what the user has to POST in the JSON dict when calling the API. Where practical, it’s helpful to give examples of param and return values in API docstrings. CKAN datasets used to be called packages and the old name still appears in the source, e.g. in function names like package_list(). When documenting functions like this write dataset not package, but the first time you do this put package after it in brackets to avoid any confusion, e.g. '''Return the metadata of a dataset (package) and its resources. '''Create a new tag vocabulary. You must be a sysadmin to create vocabularies. There are various tools that can help you to check your Python code for PEP8 conformance and general code quality. We recommend using them. pep8 checks your Python code against some of the style conventions in PEP 8. As mentioned above, only perform style clean-ups on master to help avoid spurious merge conflicts. pylint analyzes Python source code looking for bugs and signs of poor quality. pyflakes also analyzes Python programs to detect errors. flake8 combines both pep8 and pyflakes into a single tool. Syntastic is a Vim plugin with support for flake8, pyflakes and pylint.